It was a good day to wake up with a sinus infection. It was gloomy and looking as if it could rain at any minute. Not feeling too hot, I climbed back in bed after breakfast was fixed and slept until noon when the Yard Man had to leave for a meeting. I wrangled Mini-Messers 1 & 2 for a little while then sent them off to watch shark week and play with Legos while Mini-Messer 3 took his nap. I retreated to the sofa with my list and pen in hand to prepare for our "family meeting". We have started having a little family meeting on Sundays to plan our week. We delegate chores, discuss obligations and schedules. So far, so good. It only takes us about 15 minutes. I let the MM 1 & 2 choose from a few chores so they can't say, "I didn't want to do that." They have a couple of jobs to do on their own and a couple with mom and dad. It seems to be working pretty well. When the Yard Man returned from his meeting we sat down to chat for a few minutes and filled out our Call-See-Do list and our Chore Chart together. I continued to fill out our weekly B-L-D Menu and Grocery list. I created a few cute lists of my own based on the ideas I've gotten from my org books to post on the fridge as reminders for the whole gang. This system has been working quite well, so I'm sticking to it for now. It will probably change when school starts back in TWO WEEKS (Yikes!). After having it in place for a few weeks, a couple of changes hopefully won't throw us off too much. 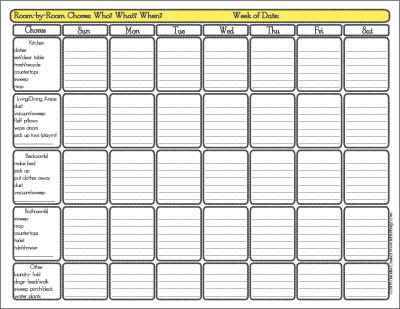 Practical Tip- I'll be happy email you a PDF of the Room-by-Room chore chart I created. Just comment below! Please send me the chore chart PDF. Thanks! oh, i desperately need to go on a 45 day journey!! i would love a copy of your chart - aflindler@hotmail.com - thanks!! hey y'all! thx for following!!! i've been out of commission with this darn sinus infection for a few days. i'll be happy to forward it to y'all tomorrow!! !